Astronaut William "Bill" Pogue, as seen prior to his launch to the Skylab orbital workshop in 1973. Pogue, 84, died on March 3, 2014. 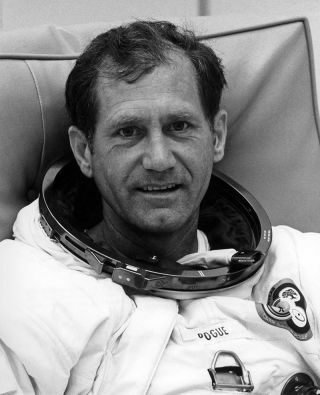 William "Bill" Pogue, a United States Air Force Thunderbirds pilot and NASA astronaut who served on the nation's first space station, died Monday (March 3). He was 84. "I was scheduled to go to the moon on Apollo 19 but [the] missions 18, 19 and 20 were canceled," Pogue wrote his 2011 autobiography, "But for the Grace of God." "Instead, I was very fortunate to fly on the final visit to Skylab and spent 84 days in space studying the Sun, the Earth below, and ourselves." Inside the space station, Pogue and his crewmates, Jerry Carr and Ed Gibson, staged an on-orbit strike, of sorts, six weeks into their stay. The astronauts took an unscheduled day off, in reaction to an overly-ambitious work plan set by NASA's Mission Control in Houston. "We didn't find out until about halfway through [our stay] that we had been overscheduled. We were having trouble," Pogue recalled in a 2000 NASA oral history. "We were just hustling the whole day." An accomplished public speaker, Pogue wrote five books. In addition to "But for the Grace of God" and "How Do You Go to the Bathroom in Space," he also penned "Astronaut Primer" in 1985 and "Space Trivia" in 2003. Together with science fiction author Ben Bova, Pogue wrote "The Trikon Deception," his only novel, in 1992. Bill Pogue is survived by his third wife Tina, three children from his first marriage to the late Helen Juanita Dittmar, and four stepchildren from his second marriage to the late Jean Ann Baird.